Whistle your way in the dark or in the light using the Whistle Key Ring. Imprint your company’s logo on this useful key chain and build customer trust in your brand. Whistle your way in the dark or in the light using the Whistle Key Ring. Imprint your company’s logo on this useful key chain and build customer trust in your brand. The whistle is sturdy and durable. It comes with a split metal key ring attachment. Its clear, high-pitched sound can be heard well above the ruckus of crowds. It is available in blue, green, red, purple, and black colors. 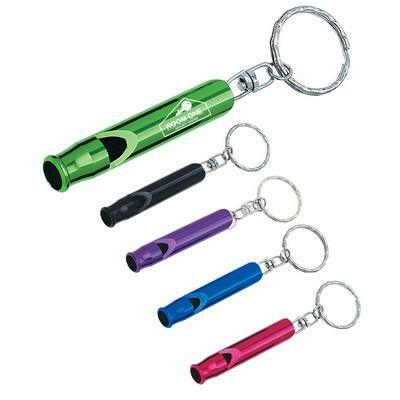 Draw attention to your brand at the next trade show or promotional event by giving away this whistle key ring.